Electric Truck Company Nikola Motors - Tesla Imitator or Not? The son of a railroad man, Trevor Milton spent his youth riding locomotives and learning the inner workings of the Union Pacific trains at his father’s shop. Little did the young boy know that years later he would be striving to build the first electric truck. Milton was fascinated by the electric-diesel hybrid engines in the locomotives, which used a diesel-fueled engine to generate power for the electric motors that made the train move. Fast forward decades and Milton, 35, the president and chief executive of Nikola Motor Co., said he’s close to making an electric truck a reality. The company will unveil the Nikola One, its first electric-natural gas hybrid Class 8 truck, on Dec. 2 and plans to have a commercial vehicle on the road sometime in 2019, Milton said. After growing up in Las Vegas, he worked calibrating diesel and natural gas storage systems for heavy-duty trucks. Eventually he started a company called dHybrid Systems that developed natural gas systems for large vehicles. Milton sold dHybrid to Worthington Industries in 2014 for an undisclosed amount, but said it was enough to launch his electric hybrid truck venture. The engines that will power Nikola’s trucks are an electric-natural gas hybrid, similar to the electric-diesel locomotives the entrepreneur rode when he was a child. The truck will contain a large natural gas tank system that will fuel a turbine, which in turn will power the electric motor. The company’s engineers have had to design the engine and truck from the ground up, but that approach will put his company 15 years ahead of the competition, Milton said. Nikola will be vertically integrated, owning everything from the natural gas refineries supplying fuel for its vehicles to the truck production centers and the maintenance facilities, Milton said. Milton said he took inspiration from Nikola Tesla, the electrician and inventor who helped found the alternating current electrical supply, not the car company that’s also named after the scientist. The companies are not related. Milton said the company has secured 7,000 deposits of $1,500 for the hybrid truck – which he values at about $330,000 each, totaling about $2.3 billion in pre-orders. That’s a strong sign that the industry is ready for a hybrid Class 8 vehicle, Milton said. But others are skeptical of Milton’s venture. 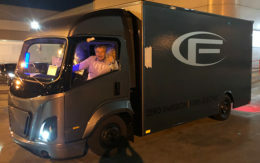 News about Nikola’s electric truck has spread quickly, said Tom De Vleesschauwer, the London-based transport and mobility practice leader for IHS Automotive, who has received calls about the vehicle from as far away as Japan. “The trucking industry is very conservative,” he said. De Vleesschauwer said he also is skeptical of Milton’s claim of a massive order backlog, adding that Nikola will need “a lot of cash” to get the truck on the road. Even with 7,000 deposits, as Milton says, a $1,500 deposit totals only $10.5 million – definitely not enough to design and build the engine and truck, put in place the natural gas infrastructure and ensure nationwide maintenance should a vehicle break down, De Vleesschauwer said. Milton, however, said he is so confident in the technology that he personally funded much of the initial $20-million investment in the company and hopes to raise $300 million in the next round of financing. Nikola has at least one established player in its stable. Meritor, the Troy, Mich.-based supplier of truck parts, said it co-designed the independent suspension on the truck. Nikola’s sales model could attract business owners looking to give it a try for a minimal upfront cost. Even after the initial round of financing, the company will require only $4,000 to $5,000 down for an electric truck lease, with fuel and maintenance included. That’s attractive to any business owner, De Vleesschauwer said. Carriers might lease some of the trucks to establish their green credentials, De Vleesschauwer said. So far, Nikola’s customers are about a third owner-operators and two-thirds a mix of large and small fleets, though Milton wouldn’t say which companies are buying. Milton said the trucking industry, which has relied on diesel technology for a century, is ready to shift to a cleaner and more efficient power source. And he contends it will happen quickly. Milton forecasts Nikola Motor will surpass Daimler, Volvo and Paccar, among the biggest truck producers, in sales within two years of delivery of the first road-worthy vehicle in 2019.